As a prelude to the theyyam performance, the system of ‘Vellatam’ is incorporated in many of the theyyams. In the vellatam no formal make up is adopted by the player. He wears a small crown or ‘muti’ specially made for this purpose. Vellatam is also a partial theyyam performance prior to full “Mudi Theyyam”.Vellatam will be performed if the Theyyam do not have a Thotam. It is very rare to have both Thotam and Vellatam for a particular Theyyam. It wears more clothes and ornaments compared to Thotam performer.There is a light painting on the face and the body also smeared with a paste made from rice and turmeric.. The thotam or the song related to the particular deity is recited by the player and by the singers in the background. The dance of the player on this occasion is very attractive. For several female deities and a few male deities the system prevalent is not Vellatam, but only “Thotam’. In this prelude of thotam the player wears no particular crown or full ornaments (“Theyyam Mudi”). The main cloth includes a “Kanikkamundu” on waist and a “Pattum Thalappaliyum” on head. There is no painting on face (Mughathezhuthu), but it will put a kind of powder offered from the “Sthana”. It usually performs on the eve of full theyyakolam. 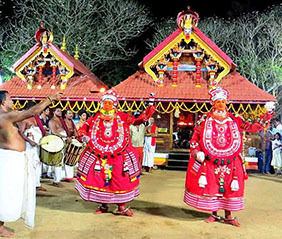 The “Kolakkaran” (Theyyam performer) with partial theyyam dress appear in front of the Kavu or Sthana with a drum and recites the “Thotam Song”. These songs are like poems which depicts their ancient history. Usually two or three men also will be there to sing the song. At the end of the song, all insruments wii be played and thotam will perform a dance called “Uranjuthullal”. The main aim of thotam is to invoke the God to enter the body of the “Thotakkaran” (performer). For all the “Mother Gods” thotam is the usual practice. The thotam song describes the origin of deities, their beauty and glandour, their journey, power and boldness. It explains the story in the form of a song which includes the origin, reason of originating, duties to be performed, ways it went through and at last the farewell. Towards the end of the thotam song full musical instruments will be played and it is believed that deity is entered the body of theyyam performer. It starts to dance and steps will be more or less like Theyyam play. Certain Theyya Thotam lasts for five to six hours with full thotam song. Tamil writings and Sangam (BC 500 – AD 500) epoch and historical evidences indicate that a form like today’s theyyam emerged about 1500 years ago, and passed through several stages of evolution. A key land mark in this process was the emergance of Malayalam as the literary language. Thotam songs louding the divinities relevant to theyyam came to be composed only after Malayalam became a mature form of literary expression. These songs were transmitted orally from generation to generation, though their authorship remain unknown.